The original SS50 was how I learned to use a clutch on a motorcycle (moped). It was owned by a very trusting friend and he let me use it on the driveway that lead to my mum and dads house on the estate. Loving the look of that bike. Based on a Monkey?. Is this purely a concept bike or is it a potential for production....nice looking thing. For some reason looking at that makes me smile. It’s got the look of an S90 from the 60s as much as anything. I like it. We had something similar on The Bike Shed rideout to Urban Rider show in Greenwich this evening. It was a c50 stepthrough frame, a 125 engine with high level very noisy exhaust, front end on conventional forks with disc brake, two pot calipers. Next time I see it I will take a photo. Royal Enfield were showing their new twins as well as a racer for speed week at Bonniville. Lots of customs there, some great, others less so. 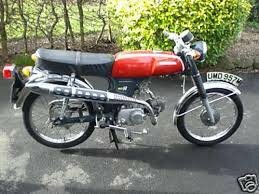 Yes, SS50 was my first bike, I can only recognise the tank as bearing much resemblance to the original though.....! I can't say that I agree with that, I think it looks a lot like the original but brought right up to date, the frame is the same type and shape as is the engine. Even the exhaust is a modern version and at the same level. Yes, I think that huge gap between engine and frame that typified the peds of that era has been captured perfectly. Is it just me or does that huge gap make it look rather flimsy? I think, it's just a concept by someone who has a real talent with cad or something. Kar Design concepts has been around for quite a while. If you follow the link to the book of faces there is a lot more there. Each month Kar Lee does an article in Classic Motorcycle Mechanics called Retro Reboot where he does his idea of a modern take on an old model. Sigh, SS50 5 speed, my first (legal) hurrumph, road bike. I paid 45 quid for it and rebuilt it for not much more. My mates sold their souls, on the drip, for fancy RD and DT 50's. Suckers, I used to pi*s all over them, scraping those funky pedals on the corners. Oh my.... imagine me and my pie belly on one now. Plastic Pig? Oh yes, £190 with 85K on the clock, talk about piston slap! Bollox to that, 20 quid for a set of oversized pistons and rings. Sod that re-bore nonsense! Get in there with a bit of wet and dry. Still, it ran like a pig on roller-skates, oh well, at least I went slower than my mates who'd sold their souls, on the drip, for GS650's, and 750's, bast*rds. "there was a young man from Belgrave, who found a dead whore in a cave"
..... and think of the money I'll save"! Nice to hear from you Ted. Which reminds me, it's that time of year again and I owe you "at least £10" for the upkeep (and the mob). I'll see to it next week when I get paid. Not sure about that side-mounted shock there tbough. It'll get a bit to warm for consistent damping. Same here Ted when the pension comes in Well, when i remember my PP details.